The best thing about comfort foods is that it is usually simple to make. I found the ham bone in the freezer that I saved from the Honey Baked Ham that Sister O sent us over the holidays so I thought I better make soup. This was so easy to make and perfect for a lazy Sunday afternoon. 1 Pk. of dried Great Northern Beans, soaked in cold water at least 4 hours or overnight. In a large pot, bring the ham, water, onions, garlic and tomatoes to boil. Cook for 30 minutes, then add the beans. 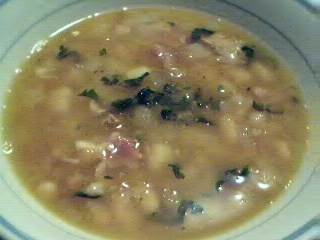 Cook until beans are tender (1 to 1 1/2 hour). Have a nice weekend to you! I passed the test for my Citizenship, thanks for your well wishes!